According to the Stoic doctrine of Apatheia, one should not be bothered by the fact that someone carelessly translates "apatheia" as "apathy", leading to misleading and inaccurate representations for comedic effect. 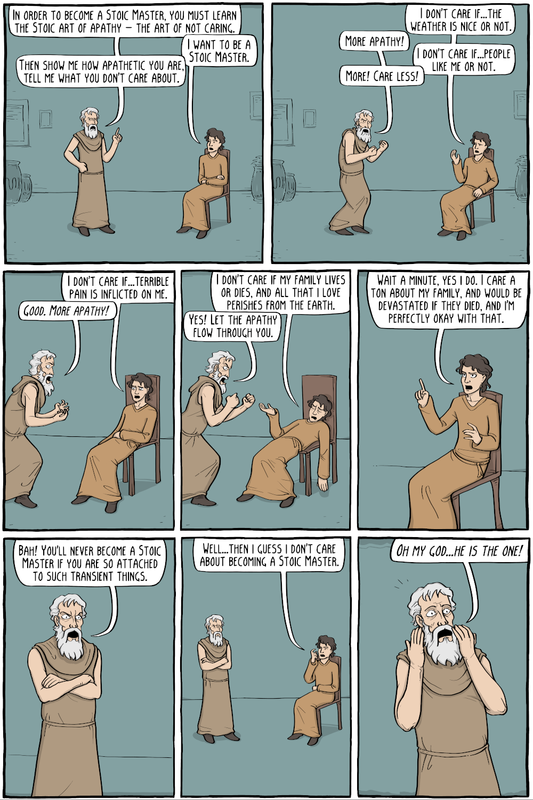 The Stoic philosophers had a concept called "apatheia", which literally translates as "apathy", but is often left untranslated to avoid confusions. Unlike the word "apathy" in English, it doesn't really mean "not caring about anything" in the sense that you have no motivations or goals, but rather have an ability to block out the word and "not care" in the sense that you are not subject to what is happening around us to control us. So in other words, we have the ability to rise above the circumstance and not be affected by them. So think of it less like a college kid who is too cool to care about doing his schoolwork because he "just doesn't care", and more like a ship captain who remains calm while his ship is sinking, evacuates the passengers, then calmly goes down with his ship. It isn't that he "doesn't care" that the ship is sinking, in the sense that he has no preference about whether the ship sinks or not - obviously he will do anything he can to prevent it from sinking, but once it is inevitable that it is sinking he doesn't allow that fact to have any bearing on his mind, or to affect his character, which is to behave honorably and with virtue.